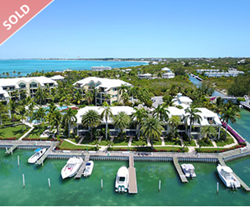 RE/MAX Real Estate Group Turks & Caicos Islands has closed the sale of a luxury 3-bedroom townhouse located in the Yacht Club Resort at the Turtle Cove Marina. The home was listed for USD $849,000. RE/MAX Real Estate Group Turks and Caicos Islands has finalized the sale of a luxury townhouse, located at the Yacht Club Resort in the popular Turtle Cove Marina complex. The townhouse had 2,300 square feet of living space, including three bedrooms and four bathrooms. The home was listed for USD $849,000. This townhouse featured a large open living area off the kitchen, a 250-square foot sunroom, and a master bedroom suite which occupied the entire top floor. An ample number of windows throughout the house created an inviting ambiance. The home also included a 50-foot boat slip, merely a few steps away from any of the townhome’s three patios. To learn more about Turks and Caicos real estate opportunities, please contact Blair MacPherson by phone at 1-800-941-0465 or 1-649-432-5677, or by email at blair(at)blairmacpherson(dot)com. RE/MAX Real Estate Group Turks & Caicos Islands specializes in luxury Turks and Caicos real estate sales, and is a member of the Turks and Caicos Real Estate Association (TCREA). The RE/MAX Real Estate Group Turks & Caicos offers unique, luxury real estate opportunities on the islands that are home to Grace Bay Beach, which has been named one of the world's best beaches numerous times. With breathtaking views, world-class spas and resorts, fine dining, local culture, and the awe-inspiring coral reefs, the Turks and Caicos Islands offer unique investment opportunities in that they are located in a tax-free jurisdiction. For more information, please visit http://www.remax-realestategroup-tci.com.